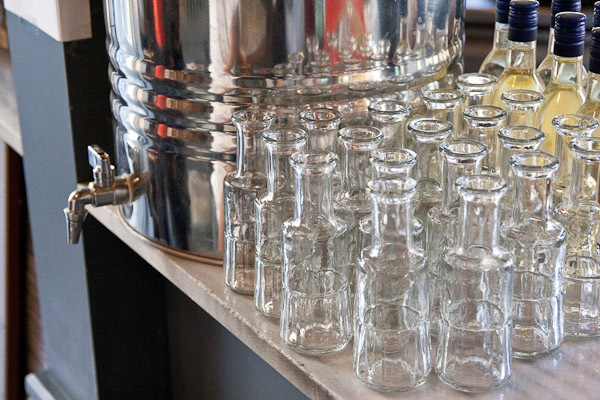 Sunday in Monastiraki – Ouzou Melathron » This, Melathron, Ouzou, Monastiraki, Athinas, Tsipouro » tobias cooks! 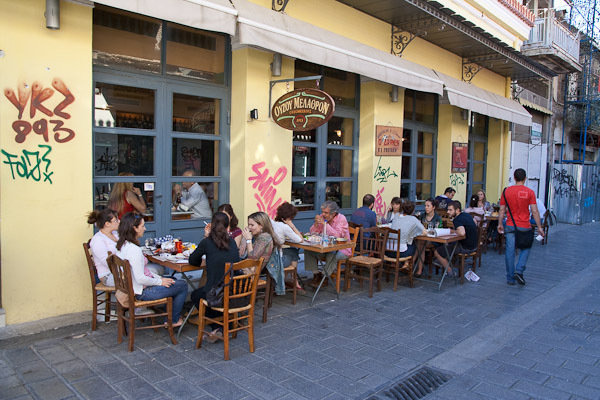 When you get to Monastiraki you have to try Ouzou Melathron. It is one of my favorite places to eat. 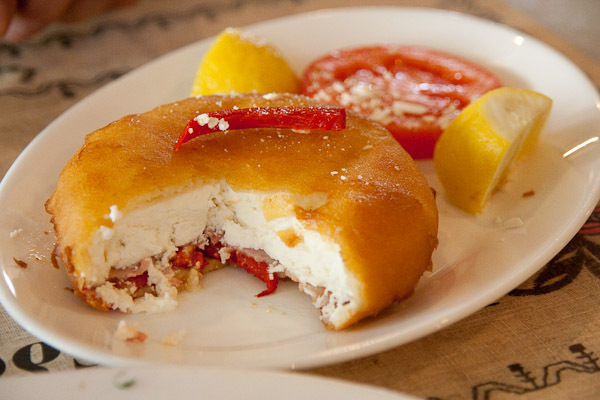 It is an Ouzo place and serves lots of Meze dishes, but it also has nice main courses. 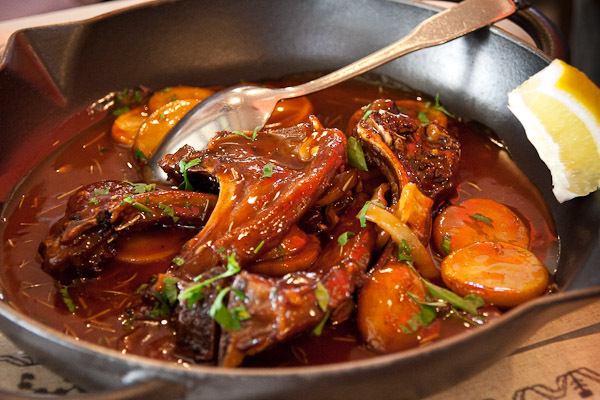 Ouzou Melathron is reasonably priced which means that a meal is 20.- to 25.- Euros per person. The people working there are friendly and chatty and enjoy what they are doing. The atmosphere is good. Having gone there a lot throughout the years I can say that the quality is good and steady. Usually you arrive with the Metro in Monastiraki. So this is where our little excursion starts. 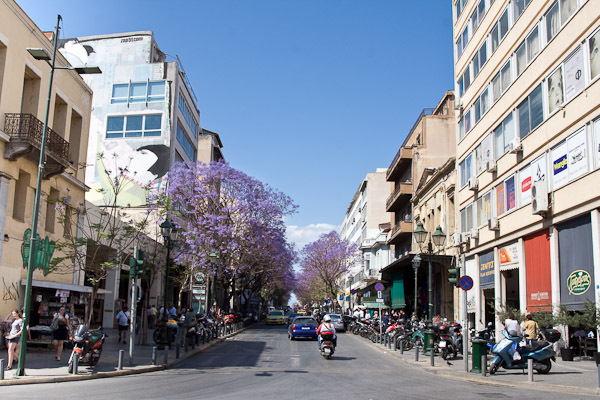 This is the view up Athinas street where it crosses with Ermou Street. Further up on Athinas is the big central market, but that is another excursion. 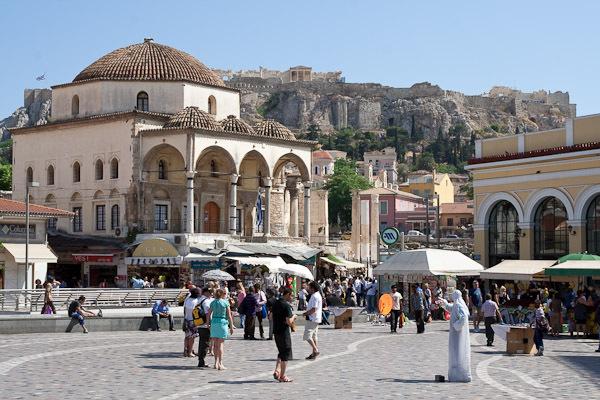 This is the view over the Plateia Monastiraki towards the Akropolis. This square is buzzing with people every day. From here we walk through the flea market towards Thissio. All shops are open on Sundays and you can buy shoes, clothes, souvenirs and all sorts of stuff. 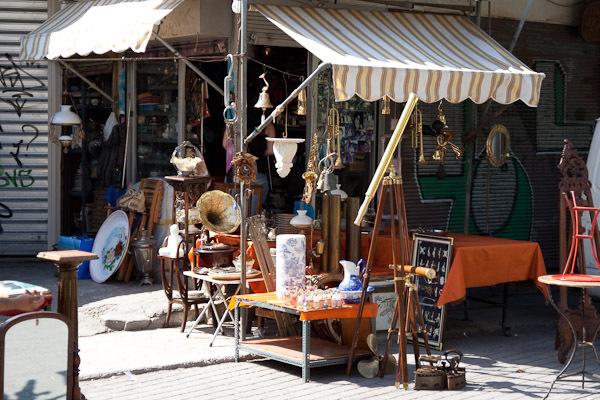 Traditionally there are a lot of antiques stores around here. Finally we have reached the end of our little walk, the Ouzou Melathron . Not far but much more quiet that on Adrianou street. Here it is nice and quiet and they serve lots of delicious things. And of course they are selling Tsipouro out of little barrels. A must for a good Meze place. Tsipouro requires you to eat some food with it. 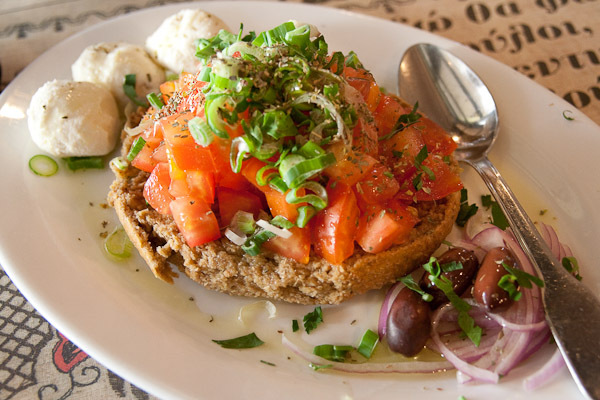 We ordered a typical Cretan dish: Dakos. Baked Manouri cheese with peppers and ham. I’ve walked by Melathron many times but skipped it thinking it was just for tourists. I’ll try it out, based on your recommendation this summer. What a great place! The food looks wonderful. Aaahhh, I need holidays! Log in | 73 queries. 0.638 seconds.